I am no die hard Marvel fan, what little I do know or think I know is giving me a lot of confusion. Ms. Marvel is the name of several fictional superheroes appearing in comic books published by Marvel Comics. 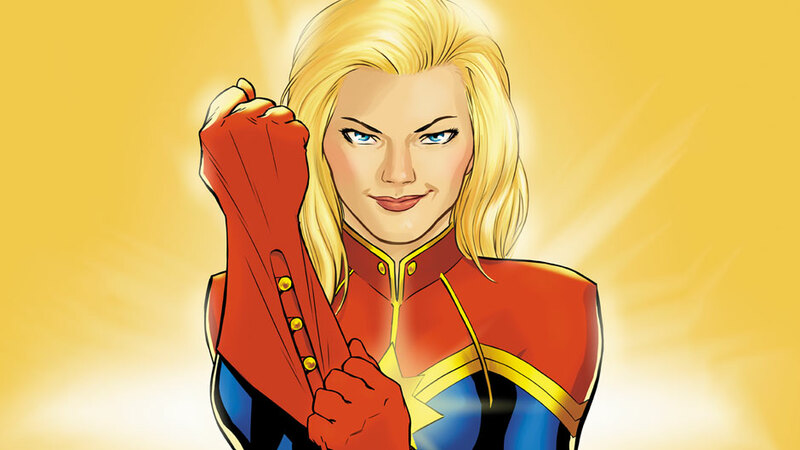 The character was originally conceived as a female counterpart to Captain Marvel. So this is saying and as seen above the original Captain Marvel was male and the name has been used by other characters. I know It's not unheard of in comic books for a superhero name or title to be used by more than one different person (example: Green Lantern: Hal Jordan and John Stewart). Sometimes there are even alternate realities or timelines. The most prominent name that turns up is Carol Danvers. Above is a close image of the Captain Marvel that will appear in the movies and who later joins the Avengers. Her costume's colors are red and blue and has something of a star shape as her symbol, that is Carol Danvers. Also, below is Carol Danvers? 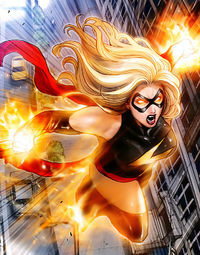 Or as I know her - Ms Marvel, costume dominantly black and has a lightning bolt symbol. I understand, contrary to the movies, that the X-men and Avengers share the same universe. For instance, Wanda Maximoff a.k.a Scarlet Witch is the daughter of Max Eisenhardt a.k.a Magneto allegedly. I don't know anything about the Captain Marvel who is affiliated with the Avengers, but I remember that Rogue before joining the X-men battled with Ms Marvel and permanently stole the latter's powers (in the 90s X-men animated series Ms Marvel was put in a permanent coma as a result). Did this event happen in the same universe or timeline with the Avengers in it? 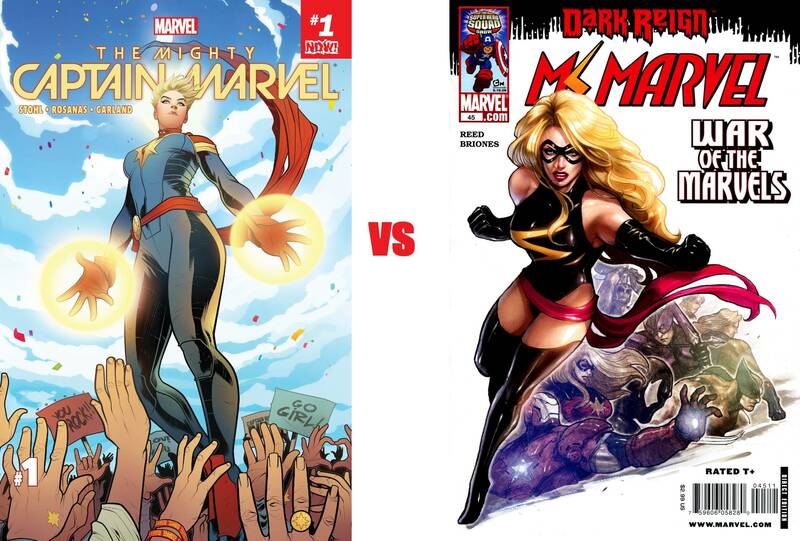 Is the red and blue Captain Marvel or the same black suited Ms Marvel? Or are they two different versions of each other? The name, and the list of heroes who have used it, can get rather complex. I'll try to summarize, and stick only to the ones that connect directly to the current one, Carol Danvers. There's a couple other heroes that have used the Captain Marvel name, the most well known being the hero that transforms by saying the magic word "SHAZAM!". It was originally published by Fawcett comics, and was eventually obtained by DC Comics - that tale of that character's history is somewhat interesting as well, from a legal point of view. That character is getting a film next year. DC lost the rights to use that name as the title of a comic because the trademark on the name lapsed during the period that nobody was publishing a book with the character, and Marvel snapped it up, creating their "Captain Marvel" character, the one in the green suit from the question above. 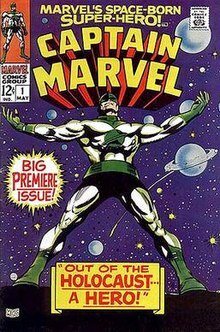 Similarly, there have been several characters in Marvel Comics who have used the name, not all of them directly connected to the story of the original one.That initial Marvel version of the character, named "Mar-Vell", was a soldier of the Kree army. Shortly after his creation, his power set and costume was changed, and given a persona thematically closer to the Fawcett Captain Marvel. He eventually died of cancer, after exposure to a nerve gas by a super villain from some years before, and as you might guess, that wasn't the end of his story either. 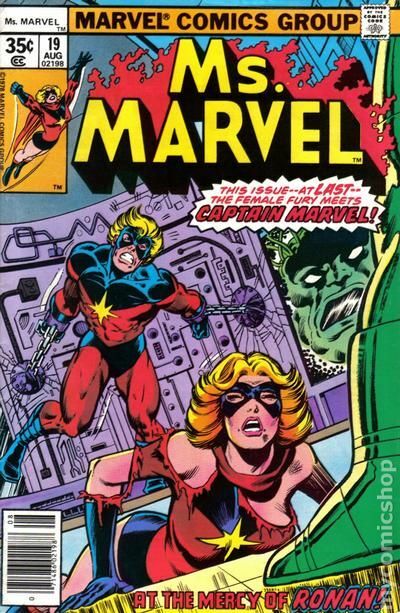 Carol Danvers came along some years into Mar-Vell's heroing career - she took the name Ms Marvel "after her DNA was fused with Mar-Vell's during an explosion, giving her superhuman powers". She lost her powers after a fight with the mutant Rogue, got a different power set as the hero Binary, another power set combining the Binary and Captain Marvel powers, and a new name, Warbird, went BACK to Ms. Marvel for a while, and eventually settled on Captain Marvel. That's a RADICAL summarization - you may want to check her Wiki - Carol Danvers for some more detail. Similarly Captain_Marvel_(Marvel_Comics) will provide more detail on the other heroes who have used the name at Marvel. While a bit political, this Vox article does a good job explaining the history of Captain Marvel. Carol Danvers was originally someone who worked with Mar-Vell (Marvel Superheroes #13). She even had a romantic relationship with the Kree version. Later, she had a run-in with a Kree device that made her half-Kree. Once she realized she had powers like Mar-Vell, she took the name herself (the story there was Mar-Vell left Earth). Generally speaking, when people refer to Captain Marvel, they mean Carol Danvers, since she's held the title longer (the original was canceled in the 70s). Your confusion is natural with regard to Carol Danvers. She has a very convoluted history (involving Rogue from the X-Men). She originally was an unpopular character and she went through several iterations, powers and costumes (i.e. Binary) before finally becoming popular as Warbird/Ms Marvel and then finally settling on the name Captain Marvel. You can read all about in Wikipedia. Furthermore; many different characters have held the name Captain Marvel from Marvel comics (Kree warrior Mar-vell, Kamala Khan, Monica Rambeau etc) and DC Comics (Shazam), which only adds to the confusion. The Original Captain Marvel was a Kree and was male. He was a member of the Kree special forces. His actual name was Mar-Vell. He was sent to spy on Earth to determine if Earth was a threat to the Kree Empire. He originally wore the green and white Kree uniform, but after spending time on earth he wore a much more colorful red and blue uniform with a yellow solar star on the chest. He had his own comic book series called Captain Marvel. While on Earth he meets Carol Danvers. They have a relationship. At some point Mar-Vell saves Carol from an explosion and the result of that incident is that Carol obtains superhuman powers. She then takes on the super hero name Ms Marvel, honoring Mar-vell. Ms. Marvel's outfit is a very skimpy version of Mar-Vell's costume. At some point Mar-Vell gets trapped in an alternate dimension called the Negative Zone (mentioned a lot in the Fantastic Four comics). He ends up being tied to a human named Rick Jones, where through the use of bracelets called the Nega-bands they can switch places so that Mar-vell is returned to the "our" dimension and Rick takes his place in the Negative zone. The bands remain with the person in "our" dimension. When the wearer strikes the two bands together the two switch places. Mar-vell ends up getting exposed to a toxic substance and eventually dies from cancer. The second Captain Marvel was a black woman. She was a police officer from New Orleans. Her abilities involved turning into a being of pure electricity. She was a member of the Avengers. She eventually changed her name to Photon and then to Pulsar. There were several other characters who used the name Captain Marvel but none of them were substantial characters until Carol Danvers. After Mar-vell's death, Captain America talks to Ms. Mar-vell and tells her that Mar-Vell would have wanted her to take on the mantle of Captain Marvel and so she changes her name from Ms. Marvel to Captain Marvel. As for the difference between Ms Marvel and Captain Marvel, she was originally Ms Marvel but changed her name a couple of years ago, I think when she started to work in space? And you are right that in the comics the X-Men are in the same universe as the Avengers, so it is likely that the history you know of Ms Marvel is the one that is still canon. Not the answer you're looking for? Browse other questions tagged marvel x-men avengers captain-marvel or ask your own question. What is Captain America's true allegiance? Why is Clint not entranced by Wanda Maximoff in Age of Ultron? How many characters have taken on the mantle of Captain America? Captain Marvel's (Carol Danver) Origin Story comic series? Is it a coincidence that both Supergirl and Captain Marvel are named Danvers? Who was the first female “Captain” or “Doctor” in comics?